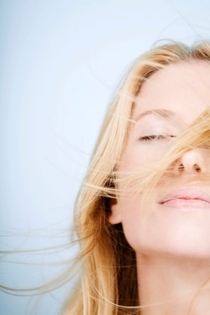 Characteristic and uses of essential oils for hair care. Its important to apply essential oils to your hair. Due to the effects of chemicals used in hair care products and hair dyes, many people suffer from a sensitive scalp. Using essential oils can help calm the skin down and make hair look healthy again. Your hair will benefit from a treatment with any of these oils even if there are no significant hair or scalp issues to cure. The best essential oils for hair can be used as often as needed and are easy and relatively cheap to purchase, unlike many chemical hair treatment products. These essential oils suitable for several hair problems, such as: Dry skin on the scalp, Split hair ends , Dry and dull hair , Very thin or fine hair. Lavender is great for soothing the scalp and calming the hair. Basil promotes growth by stimulating circulation and works well with fenugreek and ivy burdock herbs as well. Basil is used in shampoos and conditioners that are designed for scalp health. Chamomile is the most soothing of the essential oils for the hair and scalp. Chamomile helps to retract skin cells that have been inflamed from chemical procedures, the sun and helps with those that have scaly scalps in including a lot of white flakes or psoriasis. Lemon Essential oil works well for a treatment for dry scalp, dandruff, lice, and under active sebaceous glands. The sebum on the hair is what keeps it from dry out. Curly hair tends to be more dry and can benefit from lemon essential oils. Be very careful to only use lemon on hair that is too oily as this can seriously dry out the hair after just one washing or rinse. Myrrh is typically used for those have greasy hair and those that want a more purified scalp. It is used in very small quantities. Peppermint helps to stimulate blood flow to the root of the hair. This helps the hair to receive proper nourishment and to grow correctly. Peppermint makes the scalp tingle and this is what stimulates the blood flow to the hair. Rosemary essential oil works great for dry hair and dandruff as well as itchy scalp! Sage is one of the best scalp clarifiers. It deep cleanses impurities away from the scalp and works well with other herbs to heal scalp problems such as psoriasis and helps when used with zinc to end dandruff symptoms. Tea Tree essential oils works to purify the scalp. It works extremely good for those that suffer from scalp psoriasis and scalp dandruff. Ylang Ylang essential oils for Oily hair and dandruff treatment. Always remember that you cannot use these essential oils for hair direct to your hair, but you should mixed with carrier oils first. This oil can be combined with other nice smelling essential oils. Olive oil is especially beneficial for dry hair suffering from indoor heating and sun. The hair is nourished and will regain its elasticity after a treatment with this oil. Apply the oil to towel dry hair and leave on for at least half an hour. Jojoba oil can be used with any hair and skin type. Extremely damaged or breaking hair will benefit from the healing qualities of jojoba oil. This truly is one of the best essential oils for hair loss due to breakage. The oil can be applied as described before and a very small amount applied to the skin of the face will help prevent hair dye stains when dye is applied. As you can see Aromatherapy offers many benefit for you and your hair. You cant go wrong with that. Regular use of these essential oils for hair definitely results in healthy ,smooth and radiant hair. To use this invigorating Hair oil, you just start with a few drops of Hair Oil in the palm of your hand and rub into the scalp with your fingertips; then brush the hair gently and thoroughly from scalp to ends. For a complete hair treatment, apply the oil to wet hair and thoroughly massage in. Wrap the hair with a hot damp towel and leave on for 20 to 30 minutes. Remove towel and shampoo well. Want to have a healthy hair? - Achieving great-looking healthy hair with aromatherapy is not difficult, nor does it need to be expensive. With a few drops of essential oils, herbs, and flowers, you can create a variety of treatments that your hair will respond to quickly. More blends on Jojoba Oils - Jojoba (pronounced ho-ho-ba) oil is a vegetable oil obtained from the crushed bean of the jojoba shrub (Simmondsia chinenis). Jojoba oil has multiple uses and benefits, it can be used (literally) from head to toe.